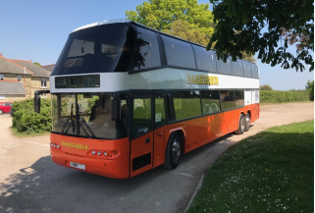 BarkerBus is an established luxury coach hire company with an enviable reputation throughout the UK for luxury standard and executive coaches and exceptional customer care. We can if required offer complete corporate travel management packages to suit your business coach hire requirements. Celebrating 30 years of experience in the coach industry. Whether you need to transfer large or small groups of people, We can provide excellent coach hire and hospitality services to support you and your business. We are ideally located close to London to provide transfers from the main London International Airports as well as East Midlands, Norwich and other UK airports if required. We are also within easy reach of the major London conference venues and many other conference and training facilities. Our luxury coaches are maintained to highest standards of safety and comfort. With a luxury fleet of coaches from 16 to 89 seats, whatever your requirements we can provide luxury coach hire and smart, helpful experienced staff to provide you with the high-quality service that you would expect from a reliable and experienced coach operator. All our coaches are immaculately presented and well equipped. On-board staff are professional, smartly dressed, uniformed if required, helpful and courteous.